At MJRevTech, we are proud to offer a complete tuning service and our fully equipped workshop, engine building area and Dyno all play a key part in producing reliable, rideable motorcycles for road or race, that are not only a vast improvement over stock but also live up to expectation. We use a Dynostar Load Control rolling road Dynamometer and the ability it gives, to control engine rpm at any throttle opening, is crucial for consistency and the precise build of a performance fuelling map. Ironically, the knowledge earned in the pre-fuel injection era, working on the Dyno with CV and flat slide carburettors has proved an invaluable foundation for everything we do with EFI. 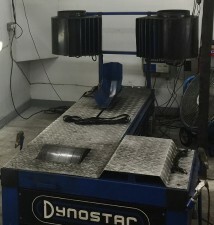 The DYNOSTAR Model 70, used at MJ RevTech, is the ultimate tool for tuning and diagnostic activities. Many reputable companies in the trade, including 6-times World Champion Ten Kate Honda, have already discovered the quality of the Dynostar Model 70. The powerful, air-cooled eddy current brake allows the dynamometer to absorb power up to 355 kW (with cold eddy current brake). For anyone professionally testing and tuning very high power motorbikes. the optional tungsten carbide anti-slip coating provides the answer, making wheel slip a thing of the past. 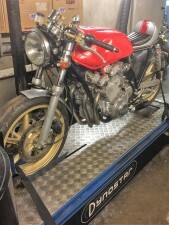 The Dynostar Model 70 is highly accurate as it runs on a 5Bar Map Sensor to enable precise mapping whilst under load, a MUST HAVE for ensuring the correct running of fuel injected turbo bikes.